Does your child snore, primarily breathe through his or her mouth, or frequently wet the bed? Does he or she suffer from daytime sleepiness and have trouble concentrating in school or experience hyperactivity? If you answered yes to either of these questions, then it’s possible your child is suffering from obstructive sleep apnea (OSA). Approximately 2-4% of the pediatric population has obstructive sleep apnea. Often caused by a narrow airway or an obstruction in the airway, such as enlarged tonsils and adenoids, OSA can be harmful to your child’s development and long-term health. There is hope, however! 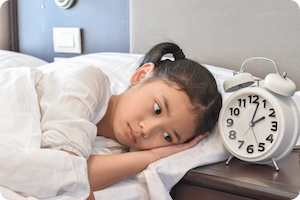 Dr. White and his team provide cutting-edge sleep apnea treatment in Glen Allen, VA, to help your child achieve a restful night’s sleep and a happy and productive day. Obstructive sleep apnea (OSA), is a condition involving repeated episodes of partial or complete blockage of the airway during sleep. When a child’s breathing is interrupted while sleeping, the body experiences a reaction similar to choking. The heart rate slows, blood pressure rises, the brain is aroused, and sleep is disrupted. It’s not uncommon for oxygen levels in the blood to drop as well. Children with sleep apnea may experience heart and lung ailments and slow growth and development due to a decrease in growth hormone production. Sleep apnea may also cause the body to have an increased resistance to insulin or daytime fatigue with decreases in physical activity, which can lead to obesity. Some children also develop attention disorders, social problems, anxiety, and depression. If left uncorrected, Obstructive Sleep Apnea can lead to even more severe health problems in adults, including death! As with any disease or condition, a thorough diagnosis, including a comprehensive health history, is important. Symptoms should be reported to your child’s pediatrician, who can then make the appropriate referral. In most cases, an ENT specialist will become involved. An evaluation by a properly trained dentist, pediatric dentist, or orthodontist is also necessary, as many of the oral conditions that contribute to OSA may go unrecognized by the medical professional. A conservative approach using nasal rinses, decongestants, and steroid sprays is typically the first line of approach. If this is ineffective, surgical removal of the tonsils and adenoids may be considered. Another treatment protocol is the use of continuous positive airway pressure (CPAP), a device that applies mild air pressure in order to keep the airway open. For those who cannot tolerate CPAP and are not a candidate for removal of the tonsils and adenoids, oral appliances can be made to force the lower jaw forward and temporarily open the airway. The appliance fits over the upper and lower teeth and is worn only at night while sleeping. Perhaps one of the most effective and safest treatments available is the expansion of the jaws in a growing child. Appliances are used to gently widen the jaws and create more room and a more favorable position for the tongue which, in turn, opens the airway leading to an improved breathing pattern for the majority of children. Schedule Your Child’s Consultation for Sleep Apnea Treatment in Glen Allen, VA, Today! 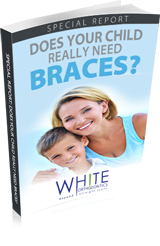 If you’ve noticed any of the above symptoms in your child or if you’re interested in learning more about OSA, then schedule a consultation with our experienced orthodontist, Dr. White, today. He will perform a thorough exam and recommend the next steps to take to help your child get the rest they need and the health they deserve. During your child’s appointment, Dr. White and his team will fully educate you on OSA, how it’s diagnosed, and all available treatment methods. He will also take the time to answer any questions you may have – we always want to make sure you’re completely comfortable before beginning treatment. Call our friendly office at 804.715.1998 today to get started – we look forward to helping your child! 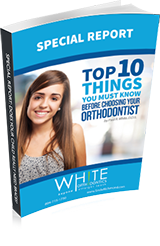 Call 804-715-1998 to speak with a White Orthodontics team member right away!